The Consumer Packaged Goods (CPG) ecosystem is complex and rife with opportunity to connect with consumers in a lasting and impactful way. The abundance of information, both on the shelf and on e-commerce sites, paired with the Instagram and DIY cultures, can make it difficult for brands to navigate successfully through this complicated space. 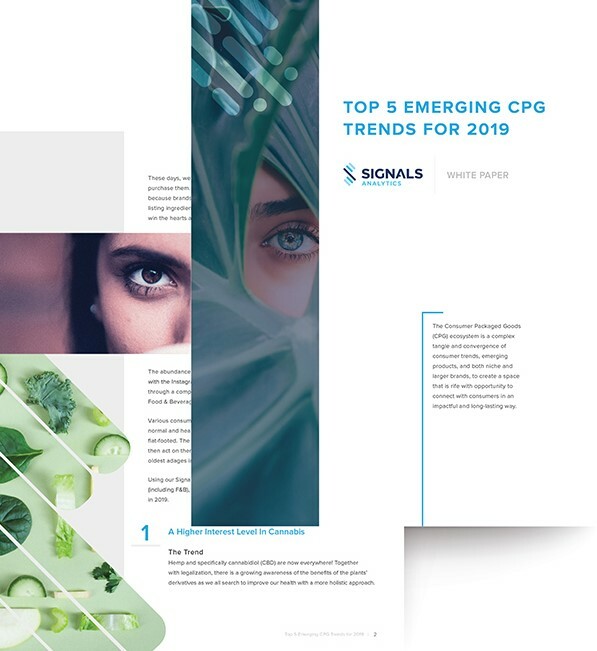 Signals Analytics, and its leading on-demand data platform Signals Playbook™, explored the consumer data around CPG, which includes Food & Beverage (F&B), to create an in-depth white paper that identifies the top trends in CPG for 2019. This report identifies trends that are poised to influence the CPG and F&B spaces in 2019. Cannabis and charcoal are just two of the five, with both gaining more exposure in the media, and consumer interest is clearly on the rise. Don’t miss the full list. Download the white paper today! Thank you for your interest in the white paper! Click below to get your copy.